[Updated] On October 15th or 16th we will have a new post on all 10 covered US states. Enno, or anyone. I see that in Eagle Ford there are 4,000 wells producing less than 10 b/d. What is the cut-off level of production while still being profitable? I guess each well has a certain amount of fixed costs attached to it irregardless of production level, implying that at some point, it is better to shut it down?? 5 b/d * 60 wti * 365 = Roughly $100k per annum. Is this enough to cover fixed operating cost? In the Eagle Ford there is also a significant gas window, and depending on your definition, there are about 2,900 gas wells (14% of the 21k wells). Most of these produce not much oil, so they will also be part of those 4,000 wells. Within our analytics service, it is possible to select only oil or gas wells. Regarding economic limits, I would recommend listening to the input from those who have access to actual cost data, like Mike Shellman. Alex, as an operator familiar with shale oil costs I believe economic limits in the Eagle Ford are somewhere around 12-15 BOPD at current prices. I am unclear why anyone would produce a 10 BOPD EF well as one significant well intervention (workover) per year would wipe out any marginal net cash flow. Ten BOPD wells may still be operated on multi-well leases, or units, but only because of economies of scale, or might otherwise be produced to avoid plugging and decommissioning costs. Hope for higher oil prices springs eternal for the shale oil industry. As does praying on ones hand and knees that interest rates don’t go much higher. Interesting. So we have nearly 50% of producing wells that is below 25 b/d or nearly 10,000 wells that will be plugged within a not so distant future. Add that to increasing decline rates and the growth trajectory will be severely reduced. About 60% of Eagle Ford wells at 60 months are at 20 b/d or lower (total wells with at least 60 months of output is 7847 wells.) If we look at wells that have been producing at least 36 months 33% of 15935 wells are producing 20 b/d or less. Of the 8088 wells that have ben producing more than 36 months but less than 60 months, about 7% of those wells are producing less than 20 b/d. All of these numbers are based on the data found here at shale profile. Can anyone comment on why the total production from the Eagle Ford looks so much different versus the other basins? 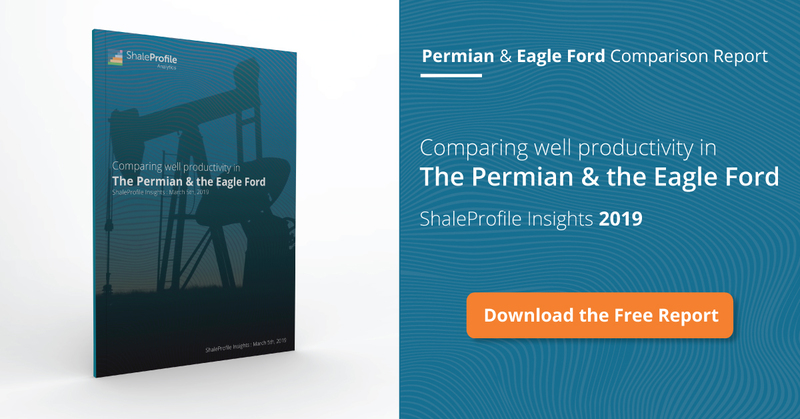 Permian, Niobrara, and Bakken have all seen significant inflections in production in 2017 and 2018 whereas Eagle Ford production remains relatively flat since 2016. Did Eagle Ford have more limited tier-1 acreage? Are we seeing the parent-child issues more significant in the Eagle Ford for some reason? I hope you will get more responses. What I see is that the rate of well productivity improvements in the Eagle Ford were the lowest of these 4 basins in recent years. What also surprises me is that I see (in our advanced analytics service) that laterals are the shortest in the Eagle Ford in the past year (even shorter than in the DJ-Niobrara), while proppant intensity (pounds/lateral ft) is the highest. Brendan, I operate in S. Texas and have RI interest in EF wells. The best answer I can give you is that the Eagle Ford is just not as good of a resource bed as other basins and I suspect that has something to do with TOC, brittleness, clays, etc., etc. There are awesome wells along the liquids-rich leg in DeWitt and Karnes Counties; in the end, however, I think folks will be stunned at the percentage of Eagle Ford shale oil wells that never reached pay out. From a business standpoint ( the only way I can view these sorts of resource plays), even with the highest product prices in America, the Eagle Ford is a financial disaster.